Has that one been used already? 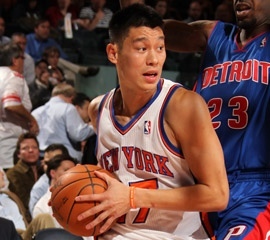 Jeremy Lin and the Knicks crushed the Kings tonight, 100-85. Our Men in Black actually made it interesting in the fourth quarter though, outscoring New York 30-23. Lin, who the Bee pointed out has a local angle, was as they say dropping dimes like he had holes in his pockets and finished with 13 assists, a career best.